Marjorie Townsend, the first woman to receive an engineering degree from George Washington University, discusses the X-ray Explorer Satellite with a colleague in December of 1970. In this historical photo from the U.S. space agency, Marjorie Townsend discusses the X-ray Explorer Satellite's performance with a colleague during preflight tests at NASA's Goddard Space Flight Center. Townsend, a Washington DC native, was the first woman to receive an engineering degree from The George Washington University. She joined NASA in 1959 and later advanced to become the project manager of the Small Astronomy Satellite (SAS) Program. 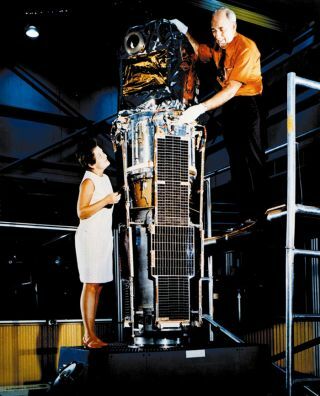 The satellite shown in the picture, SAS-1, was the 42nd in NASA's Explorer series, a family of small, simple satellites sent to perform important scientific missions for minimal cost. The first Explorer satellite launched in 1958, months prior to the formation of NASA, initiating a program of exploration that has continued into the twenty-first century. SAS-1 continued the tradition of crucial science projects by carrying the first set of sensitive instruments designed to map X-ray sources both within and beyond our own galaxy, the Milky Way. Also known as Explorer 42 and the X-ray Explorer, it became the first American spacecraft launched by another country when an Italian space team launched it on December 12, 1970 from a mobile launch platform located in international waters off the coast of East Africa. It mapped the universe in X-ray wavelengths and discovered X-ray pulsars and evidence of black holes. The satellite was named Uhuru, which means freedom in Swahili, because it was launched from San Marco off the coast of Kenya on Kenya's Independence Day. In the 1970's the Italian Government made Townsend a Knight of the Italian Republic Order for her contributions to the United States-Italian space efforts. In 1990, Townsend joined BDM International Inc., as the director of Space Systems Engineering with the Space Science and Applications Division.